The obvious place to start for anyone seeking a sophisticated introduction to everyday economic concepts is heterodox economist Ha-Joon Chang’s magisterial bestseller Economics: The User’s Guide. Alas, not this time. The concept of ‘saving’ doesn’t even warrant a place in the index. This is not to say that the practice of putting money in the bank (and its equivalents) is not mentioned – there is of course a chapter devoted to finance – but rather to remark that this practice is not considered by Chang, of all people, a substantive dimension of the basic functions of the capitalist economy. Should this surprise us? Millions of people regularly save in some form or another – whether in banks, as is common in Western economies, or in other assets like livestock or jewellery – and it clearly matters to their financial well-being. And we assume, don’t we, that the many billions of pounds ‘being saved’ every year by individuals add up to an integral role in keeping the economy ticking over in some way, especially if that money is banked rather than saved as cash meaning that it can be lent out again? Indeed, doesn’t the process of ‘financialisation’, associated largely with Anglo-American capitalism, mean that saving now matters more to the economy, not less? saving, seemingly the most simple of financial behaviours, has been complexified beyond recognition, to the point, perhaps, of having become redundant as a meaningful term for understanding the financial system as we know it today. Saving is usually defined by what is not: that is, it is what one does with income that we decide not to spend. Saving is an activity that occurs in time; a financial ‘flow’, related to, but not to be confused with, ‘savings’, a more colloquial term for the asset (or ‘stock’) that saving might produce. Moreover, the saving process could be – in fact, usually is – explicitly intended to enable spending, albeit at a later point in time, such as during retirement, holidays or in the case of an emergency (a process known as ‘deferred consumption’). So what, exactly, does saving do for the economy in the meantime? This question has become increasingly murky given the transformation in the ways banks do business. Folk wisdom suggests that banks take the saved money of those with surplus income, and lend it back out to those needing credit, with the difference between the interest paid out on deposits and the interest received on loans representing the bank’s revenue, allowing them to make a profit while performing an economically useful function. 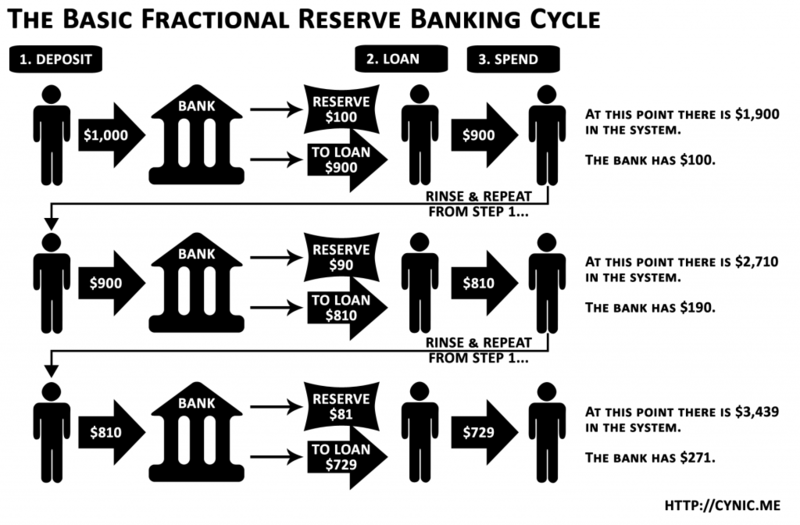 In current practice ‘fractional reserve banking’ means that banks lend far greater sums than they hold in cash deposits – meaning they create rather than simply circulate money. Many argue, understandably, that these money-creation powers afford banks a privilege far beyond what is justified by the provision of a money-storage mechanism, especially when the system can never be entirely secure from lots of people trying to withdraw their deposits simultaneously. Nevertheless, it is clear that saving still plays an important role in a monetary order based on fractional reserve banking. What has changed? In many economies, the cash reserve has become an ever-smaller fraction of the money being created, since banks tend to create money based on the perceived likelihood of a loan being repaid rather than any rigid formula based on the volume of deposits. And Western economies – particularly the UK – have generally become more dependent on banks’ willingness to lend irrespective of deposits as they finance themselves on the money market, which tends to increase financial volatility. One of the consequences is that central banks now play a more active role in underwriting bank balance sheets, which tends to diminish even more the importance of deposits to bank business models. There are other relevant trends worth noting. Firstly, the rise of investment banking and its focus on raising finance for corporations means that even high-street banks can make (large) profits in ways other than differentiated interest rates for savers and borrowers. Secondly, securitisation, which involves the creation and sale of financial products backed by revenue sources – such as securities backed by the repayments on individual mortgage loans – has convinced many banks that lending is much less risky and therefore need not be dependent on cash deposits. Thirdly, shadow banking, those forms of financial intermediation that escape official banking regulation, also offers a wider range financing for banks by drawing on funds other than savings deposits, like investors’ cash and, predominantly, debt-based instruments. The 2008 financial crisis raised serious questions about the soundness of this business model for the banking sector. 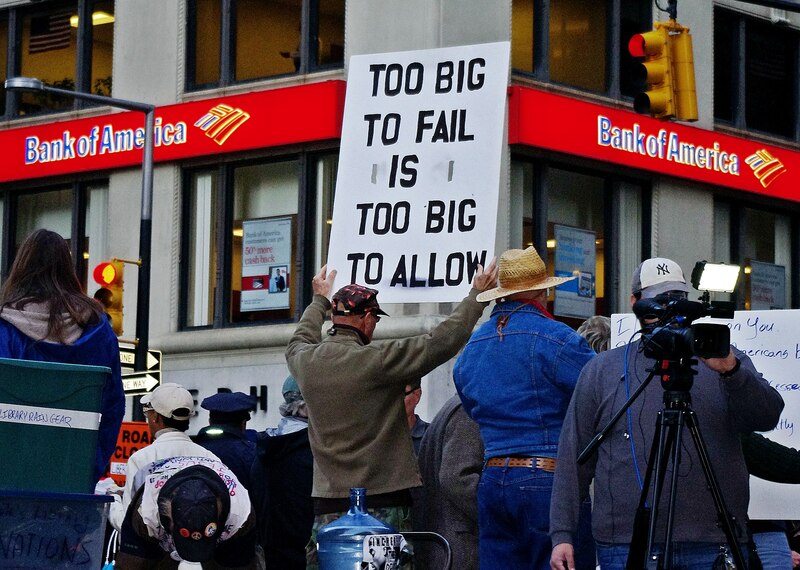 Nevertheless, many Western economies remain left with huge finance sectors and banks that are ‘too big to fail’. Their economic significance means that the public is increasingly required to support them collectively as taxpayers via bailouts, rather than individually as savers via deposits – despite the fact that bank activities have been thoroughly internationalised as part of these trends. It is also worth noting here that there are alternatives: many countries support public investment banks, offering a model in which money available for lending is provided directly by the state. While attracting savings might matter less to banks, a population’s ‘saving rate’ is still important for the macro-economy. In theory, saving enables investment, which in turn enables productivity gains (assuming that financial institutions convert accumulated savings into investable capital in order to generate a return). One of reasons, therefore, for the UK’s lagging productivity growth, so the argument goes, is its low saving rate. 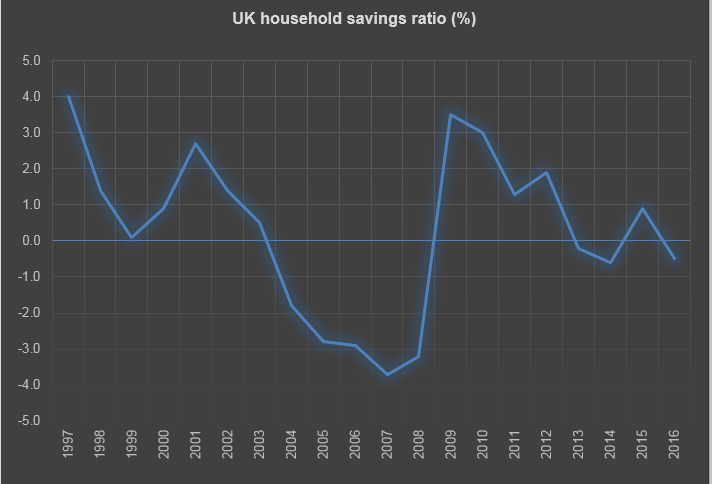 A higher rate of saving was therefore established as one of the key tests of the economic ‘rebalancing’ agenda of the Conservative-Liberal Democrat government (2010-2015). But as shown in the graph below, this test was failed as the higher rate evident after the recession (2007-2008) quickly reverted to trend, and by 2013 households were once again spending more than they received. The UK economy’s struggle to boost savings can be seen as a consequence of experiencing very low interest rates, which act as a disincentive to savers. 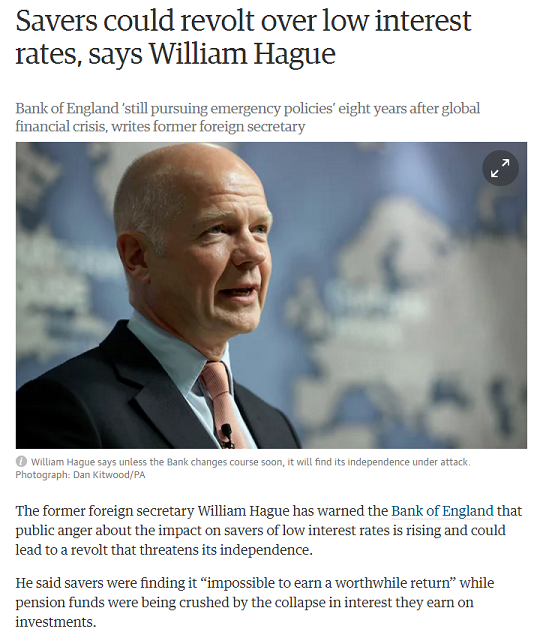 Some people have called for the UK’s central bank to raise its interest rate (see the newspaper story below). But what they overlook is that this policy is arguably both required by the City of London’s global function in providing low-cost finance, and desired by policy-makers keen to support consumption through consumer borrowing. It would also have a devastating impact on highly-indebted low-income households. There is also the fact that in liberal market economies a higher saving rate is not something that can be easily engineered by policy-makers. The saving rate is much more a function of the interaction between demographics, labour supply, wages and technological change. For example, during the 2000s rapid growth in low-income economies with relatively young populations and low wages led to an increase of saving by businesses, known as ‘retained earnings’, which was used to buy financial assets in the US. According to Ben Bernanke, in remarks made before he became chair of the US central bank, it was this ‘global saving glut’ and constant inflow of money into the US that kept interest rates in the country so low. He argued that this had fuelled some investment, but largely in house-building linked to the growing property market; a bubble that would ultimately burst in the sub-prime mortgage crisis. From a welfare perspective, population ageing of course requires more saving. But it is important to be clear about what kind of saving is being referred to here. The form of saving that is relevant for both investment and welfare is long-term saving, invariably taking the form of saving for a pension. There was a brief moment in the 1990s when it appeared that economies such as the UK and US had hit a demographic ‘sweet spot’ in this regard, with well-capitalised pension funds able to launch a new era of long-term investment – so-called ‘pension fund capitalism’. The moment passed rather quickly, however: collective pensions saving vehicles gave way to individualised saving products, as the employer-employee relationship began to evolve in a more globalised (and financialised) economic environment. It is into these individualised products that most employees in the UK have been, or will be, automatically enrolled as the government seeks to nudge people to save more for their retirement. Many Western countries have established similar schemes, particularly the Anglosphere. Because neither the state nor employers are prepared to guarantee the returns associated with investing in these funds, investment strategies are likely to be fairly conservative, focusing only on low-risk assets such as government bonds. Moreover, we should not assume that quasi-mandatory pensions saving will increase overall saving rates, since it may simply displace other forms of saving, and there are few incentives for individuals to make contributions above the legally specified minimum. From this perspective, automatic enrolment is a red herring. It is more likely that China, rather than Western countries, will soon hit a demographic sweet spot that makes an investment-led growth strategy a genuine possibility. It is going to have to find, however, more productive uses of the savings its economy generates, insofar as population ageing means it will no longer be able to rely on labour-intensive production. It might also require, in order to allow new saving and investment vehicles to develop, the kind of financial market liberalisation that China has long been reluctant to adopt – not least because it might make the Chinese economy more vulnerable to the financial volatilities that have affected the West. In recent years, critical political economy literature on saving has tended to focus on the activity itself, rather than its macro-economic implications, with many scholars arguing that individual behavioural change in this regard is central to the process of financialisation. Accordingly, the ‘everyday’ political economy literature emphasises the extent to which, by saving (primarily for a pension), individuals have become intimately connected to complex and risky financial markets. On this view, saving is transformed from a form of insurance (from the individual’s perspective) to a more direct form of investment, from which a return is sought. The closely-related ‘cultural’ political economy literature emphasises the moral component of financialisation, with individuals encouraged to embrace risk as a hallmark of responsible financial behaviour. Arguably, post-crisis narratives of austerity have entrenched this norm by further justifying the individualisation of welfare provision. 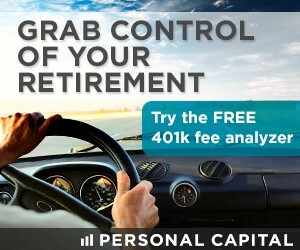 In other words, taking personal responsibility by saving for unexpected costs like medical bills or unemployment is seen as valuable in and of itself. In both literatures, however, the subject is not simply the saver, but also the borrower. This reflects one of the characteristics of financialisation, which is that individuals are encouraged to save and borrow simultaneously. One of the additional limitations in the notion that automatic enrolment into pension schemes will increase the saving rate is that such an outcome would depend on prohibiting borrowing, at least to some extent – and this is very unlikely to happen. In fact, all such initiatives must be seen alongside efforts to encourage indebtedness (by maintaining lax regulation on credit card lending, for example) or even compel it (in the form of increased tuition fees for university students). The accrual of debt at the micro-level is the lifeblood that keeps the financialised macro-economy going. As such, housing-related debt is often described as if it were a form of saving or insurance – and products such as equity release, where people sell their house to fund a retirement income, help to materialise this rather odd cognitive contortion. Where saving has been more important to the UK government’s economic agenda, though, is its imagery of thriftiness that has underpinned austerity and cut backs to public spending. In a conventional, material sense, saving has indeed withered – while the ideological force of the concept has strengthened. Interestingly, saving was discussed in more negative terms during the 2017 election campaign in the UK. It remains to be seen whether this new feature of British political discourse will persist. Berry, C. (2016) Austerity Politics and UK Economic Policy. London: Palgrave. Christophers, B. (2013) Banking Across Boundaries: Placing Finance in Capitalism. Oxford: Wiley-Blackwell. Clark, G. (2000) Pension Fund Capitalism. Oxford: Oxford University Press. Langley, P. (2007) The Everyday Life of Global Finance: Saving and Borrowing in Anglo-America. Oxford: Oxford University Press. Berry, C. (2016) Austerity, Ageing and the Financialisation of Pensions Policy in the UK, British Politics, 11(1), pp. 2-25. Bryan, D. and Rafferty, M. (2017) Reframing Austerity: Financial Morality, Savings and Securitization, Journal of Cultural Economy, 10(4), PP. 339-355. Sgambati, S. (2016) Rethinking Banking: Debt Discounting and the Making of Modern Money as Liquidity, New Political Economy, 21(3), pp. 274-290. Watson, M. (2009) New Labour’s “Paradox of Responsibility” and the Unravelling of its Macroeconomic Policy, British Journal of Politics and International Relations, 15(1), pp. 6-22. Berry, C. (2014) Pension Funds and the City in the UK’s Contradictory Growth Spurts, paper presented at Capital Divided? The City of London and the Future of the British Economy, City University London, November 2014. Berry, C. (2017) The Declining Salience of ‘Saving’ in British Politics, SPERI Policy Brief No. 28, August 2017. Crossley, T., Emmerson, C. and Leicester, A. (2012) Raising Household Saving. London: Institute for Fiscal Studies. Haldane, A. (2017) Productivity Puzzles, speech delivered at LSE, 20 March 2017. Weldon, D. (2015) ‘Was Piketty Wrong about Inequality?’, BBC News, 17 September 2015.